TENS is an alternative for you to drugs for pain management in the beginning stages of labor. TENS is an acronym that stands for Transcutaneous Electrical Nerve Stimulation. A TENS unit has several parts that make up a single unit. A hand-held controller is typically battery operated. The controller is connected to a series of pads that connect to your body. A gel is used to attach these pads to your body. The whole unit is fairly simple to operate. A TENS unit is safe. The machine works by sending little zaps or pulses through your skin. It accomplishes this by use of the leads attached to your body via pads. Once the shock reaches your skin it then moves through your tissues and muscle. Depending on if your settings you could receive a very mild tingle feeling or a more severe zap. All levels are safe but relate to personal preference. When you are in labor simplicity is the priority. You don’t need anything adding stress. The controller for most units is easy to hold, even when in incredible pain. If that isn’t something you want to worry about there are options. Try a lanyard or clipping it to your gown. Heck, tape it to your bed if you need to. Just do what is best for you! The controls of a TENS machine are designed to be straightforward. The buttons determine how fast and how strong the electricity is. If the current setting is not strong enough there is even a boosting button. A quick press should help alleviate any pain. Whatever it takes to get you safely through your contractions! What is the main contraindication for the use of a TENS machine? According to the American Cancer Society, if you have a heart problem a TENS machine is not going to be for you. The heart has too many electrical pulses as it is to go adding possible interference. Obviously, consult with a doctor but this is a general rule. Also if you have an implantable device should not use a TENS machine. Implantable products are defibrillators and pacemakers among others. Implantable devices work by delivering small, regular impulses that keep the heart in a normal rhythm. 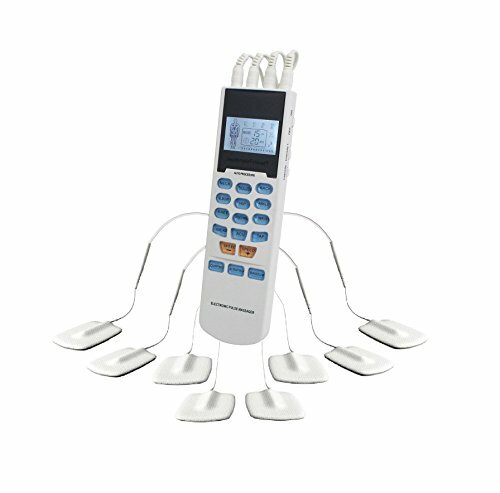 A TENS machine consists of your electrical power unit connected by wires to a pair of electrodes. The electrical signals travel from the TENS unit through wires to the electrodes. A mild electrical current travels through the electrodes into the body, near the source of pain. The electrical signals the TENS machine sends may interfere with how your implantable device works. Always keep in mind any special instructions from your doctor. They know what they are talking about. They are also looking out for your best interest at heart. A TENS is not the end all be all. There are plenty of safe alternatives. Is electrical stimulation safe during pregnancy? Although it may sound scary to consider small electrical shocks entering your body, the sensation caused by transcutaneous electrical nerve stimulation is not at all hurtful, and instead feels similar to a tickling sensation. The current used is mild. TENS is considered to be safe and very useful during labor. This study provides you great insight on the use of TENS when pregnant. The study shows that early pregnancy is not a good time to use the device, but labor is. The machine works by blocking pain signals sent to your brain from the back and uterus. This is happening as contractions happen. Researchers believe that electrical nerve stimulation also causes the production of natural pain-relieving chemicals in your brain. Can I use an electric massager while pregnant? This is up for debate. As there are so many varied models that work in different ways it is hard to say. A blanket statement would be dangerous and not helpful for sure! Ask your doctor about what they think is best. Bring the massager with you or bring pictures. If you bring picture maybe even print out the model number and specs. This gives the doctor a full picture of what to recommend that is best for you! What is TENS good for? The ancient Romans actually used a primitive version of TENS. They were small fish that sent electrical pulses when stimulated. It worked but was sporadic and unpredictable. Today you have the ability to simply go buy or rent a TENS machine. This gives access to small electrical shocks that can help relieve pain. TENS, when applied correctly, relieves much of the pain associated with carpal tunnel. Not everyone sees results but it is worth investigating and maybe renting a unit to try. Similarly, shoulder pain is commonly treated with TENS. Not only does it help with physical pain but it acts as a kind of mental reboot. Many people finish a TENS session and feel relaxed and rejuvenated. One really exciting aspect of TENS is migraines. OK, well migraines are not exciting. They are excruciating and painful. They wear on your mind because they are difficult to manage. It can ruin an otherwise productive day. New TENS units are coming on the market specifically designed for chronic migraines. If this is something you have suffered with I strongly urge you to investigate. If something like this could eliminate all those long painful days, it’s worth it.